This is a quick and easy salad to fix. If you've never tried canned sardines before, you'll be surprised how tasty it can be in this salad! Per serving: 320 calories; 19 g fat ( 4 g sat , 10 g mono ); 67 mg cholesterol; 25 g carbohydrates; 0 g added sugars; 18 g protein; 7 g fiber; 686 mg sodium; 587 mg potassium. Makes 4 servings. 354 calories per serving. 1. Thaw fish, if frozen. Preheat oven to 425°F. Line 15x10x1-inch baking pan with foil. Lightly coat with cooking spray; set pan aside. Rinse fish; pat dry with paper towels. Cut fish into 3- to 4-inch pieces; set aside. 2. In shallow dish, combine cornmeal, pecans, and salt. In another shallow dish, combine flour and cayenne pepper. In small bowl, combine egg product and water. Dip each piece of fish into flour mixture to lightly coat, shaking off any excess. Dip fish into egg mixture, then into pecan mixture to coat. Place fish in center of prepared baking pan. 3. In large bowl, combine zuchhini and sweet pepper. Add oil and seasoned salt; toss gently to coat. Arrange vegetable mixture around fish, overlapping vegetables as needed to fit into pan. 4. Bake for 20 to 25 minutes or until fish flakes easily when tested with a fork and vegetables are tender. These muffins are quick and easy to make! 1. Lightly spray muffin pan cups wih nonstick cooking spray; set aside. 2. Stir together the flour, baking powder, and Splenda; set aside. 400°F for 25 minutes or until lightly browned. It has indeed been a while since I last posted on this blog! The cooking bug has struck and I have been cooking up a storm! Not all are low carb or diabetic friendly, unfortunately. This tangy tomato anchovy salad is a light and simple dish to prepare. Mix all ingredients in a bowl, dish it out on a plate, and it is ready to be served. 2. Meanwhile, in 12-inch nonstick skillet, heat oil over medium heat. Add chicken; cook 4 to 5 minutes, stirring frequently, until chicken is no longer pink in center. Remove from skillet. 3. Increase heat to medium-high. In same skillet, cook and stir mushrooms and garlic 2 minutes. Stir in tomatoes, onions, basil and pepper flakes; cook and stir 1 minute longer. 4. In 2-cup glass measuring cup, mix cornstarch and broth until smooth. Add to vegetable mixture in skillet. Cook and stir 1 to 2 minutes or until sauce is thickened and bubbly. 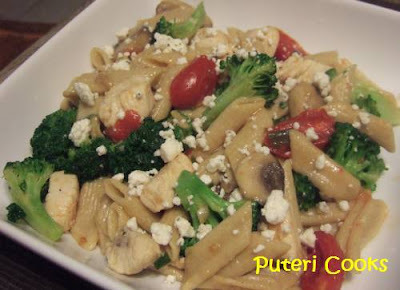 Stir in pasta mixture and chicken; cook and stir until thorougly heated. Dish out in serving plates and sprinkle with cheese. Instead of butter and eggs, these chewy drops contain peanut butter and banana. 1. Preheat oven to 350 F. Lightly coat large cookie sheet with cooking spray; set aside. 2. In large bowl, combine banana, peanut butter, honey, and vanilla. 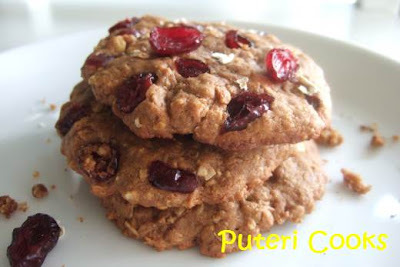 In small bowl, combine oats, flour, milk powder, cinnamon, and baking soda. Add oat mixture to banana mixture, stir until combined. Stir in dried cranberries. 3. Drop dough by rounded tablespoons 2 inches apart onto prepared cookie sheet. Flatten dough mounds slightly. Bake for 10 - 12 minutes or until lightly browned. Transfer to wire rack; cool. 1. 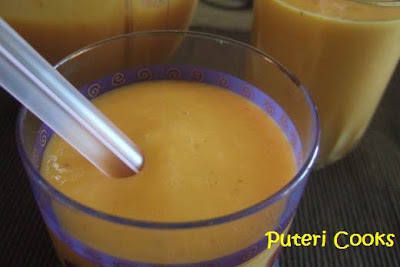 In blender, combine mango, peaches, milk and yogurt. Cover and blend till smooth. 2. Slowly add ice through hole, blending until nearly smooth.